A falling dollar is giving support to crude oil prices, which today is once again pushing against new three-year high prices. Yesterday, prices fell slightly, though remained above $65 throughout the day. Today, prices are trending towards higher ground – although prices opened lower than yesterday’s close, prices are currently 9 cents above their closing price yesterday, trading at $65.60. Diesel prices picked up half a cent yesterday, bucking the trend of falling oil prices. Overnight, prices erased most of yesterday’s gains, so markets are currently working to gain back their increases. Diesel prices are currently $2.1185, trading 0.3 cents higher than yesterday’s closing price. Gasoline fell yesterday, giving up over half a cent to close at $1.9154. Overnight, gasoline prices fell a significant 1.2 cents (-.6%), so like diesel, gasoline is struggling to catch up to yesterday’s closing trade. Although prices have risen since this morning, they remain 0.4 cents below yesterday’s close, trading at $1.911. The U.S. dollar has been struggling lately following the U.S. Treasury Secretary seemingly endorsing a weak dollar. Although President Trump commented that the dollar will be strengthened by his administration, markets are skeptical, particularly with Trump speaking at the World Economic Forum soon. 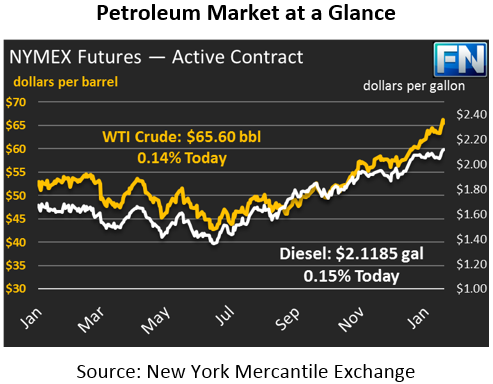 A falling dollar gives added strength to crude markets, helping to spur the oil market rally still higher.